A masterpiece of Qing dynasty painting and poetry has been rediscovered after having spent decades in the penumbra of the antiquities market. It is a handscroll called the Ten Auspicious Landscapes of Taishan painted by Qian Weicheng (1720-1772), a most favored official, poet and court painter of the Qianlong Emperor (r. 1736-1795). The scroll is 15 feet wide and 13 inches high and is divided into ten sections, each depicting a different landscape of Mount Tiantai (also known as Tiantai Shan). Each scene is drawn from a distance, which gave Qian Weicheng the opportunity to depict the great diversity of of the mountain views — highest peaks, lowest ravines, rivers, lakes, waterfalls, trees, caverns — and of the religious and historic sites that inhabit the ecosystem. 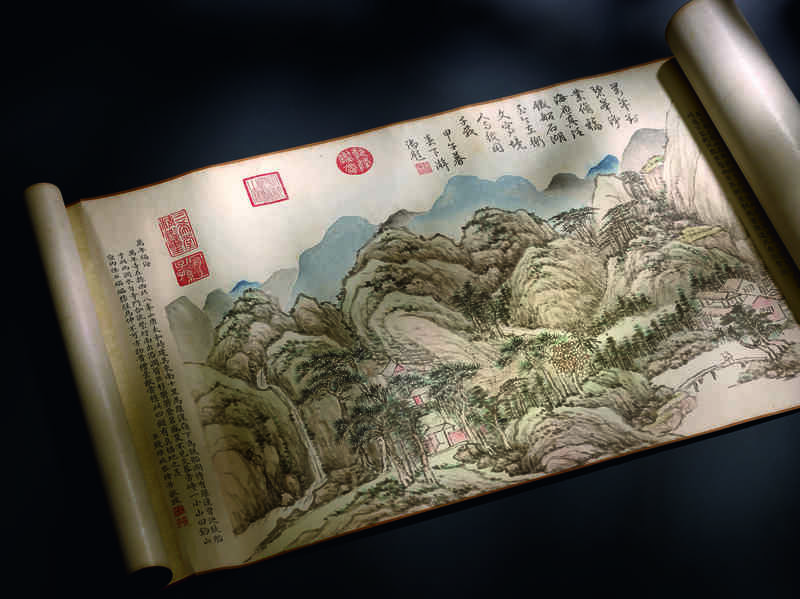 Famed for his great talents as a writer and an artist, Qian Weicheng made use of both of gifts in this handscroll making it one of his greatest masterpieces crafted at the height of his career as court painter. 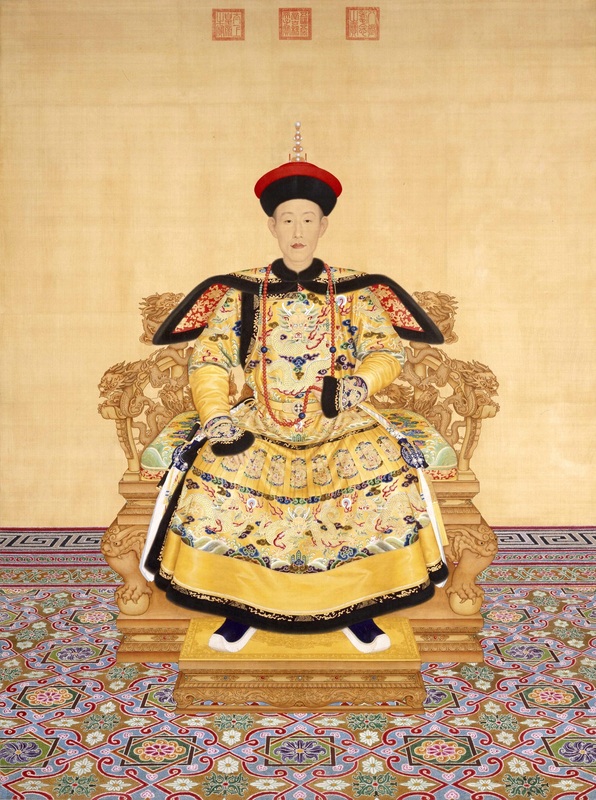 The Qianlong Emperor was the longest the longest lived emperor with the longest reign in Chinese history. He was a dedicated lover of the arts, particularly painting and calligraphy, and a collector of such fervor that he amassed more artworks than any emperor before him. His court officials, all highly literate in the first place to have passed the civil examinations that were a requirement to be recruited for imperial service, were most favored if they had artistic and literary gifts. An explosion of creative arts ensued, and the Qing court is widely considered a Golden Age for Chinese art and literature. 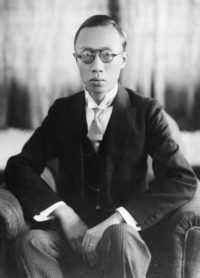 Qian Weicheng was a golden boy of this golden age. The scion of a prominent literary family, he was writing poetry by the time he was a young child and received his first public accolades for a poem published when he was 17. He placed first in his exams in 1745 and was brought into imperial service, climbing the ladder quickly due to his meticulous attention to duty in every position from Vice Minister of Works to Vice Minister of Justice to Education Minister of Zhejiang, to the presiding judge over an extremely complex embezzling trial. His deliberate, logical, impartial approach emphasizing adherence to clear moral standards impressed the Emperor. His ability to paint and write poetry brought him even more imperial favor, and the Qianlong Emperor often chose Quian to accompany him on official tours of the empire. Afflicted with diabetes which made him frail and skeletal, Quian died when he was just 52 years old after a long and strenuous trip home after the death of his father. The Emperor felt the loss of his favorite ministerial and artistic luminary keenly, and granted him the posthumous name of Wenmin (literal meaning “cultivated”), a prestigious title reserved for officials of great note. Two years later, the Qianlong Emperor was still mourning Qian Weicheng, a fact attested to by the Ten Auspicious Landscapes of Taishan. Each of the ten landscapes is accompanied by a description of the site written by Qian Weicheng. He describes the view, pointing out the natural marvels as well as the legends and history associated with each location. In the tenth section, his description, which like the other nine manages to be geographically and topographically accurate and intensely poetic at the same time, concludes with his signature. Wannian Temple and Blissful Water. Built during the Taihe reign of the Tang dynasty, the Wannian Temple is located in Mount Bafeng to the northwest of the county. Ten li-miles to its southeast is the Luohan Peak overlooking the Tiechuan Lake, or literally “lake of the iron boat”, after the legend of a luohan passing through here in an iron boat. Off the front gate of the temple is a confluence of two streams meandering westwards. The streams are lined with gigantic cedars that provide shade even in high summer. On the side is a small hill called Liao, with its valley strewn with grotesque rocks resembling dangling gibbons, stretching birds or any imaginable shapes. This indisputably blissful land is where the Jin monk Tanyou rested to take in the view. Painted and inscribed by your humble servant Qian Weicheng. Ten Auspicious Landscapes of Taishan has another remarkable feature: each of the ten sections includes a poem written by the Qianlong Emperor himself in his own hand. He played off Qian Weicheng’s descriptions as both a tribute to the many beauties of Mount Tiantai and to his favorite artist. This is the poem he wrote for the 10th landscape, an adroit and touching parallel to Qian Weicheng’s final note and signature. Wannian is for cultivation and purification. Will be remembered till eternity. Inscribed by the Emperor late in the third lunar month of the jiawu year. inspecting education in Zhejiang and painted this for presentation. Now that he has been gone for two years, all that is left is this scroll.” That suggests the painting was was done between 1763 and 1765 during or just after Qian’s term as Education Commissioner of Zhejiang. The date is likely correct, but the Emperor was mistaken. Qian never actually did get around to visiting Mount Tiantai in person. We know from his own poems that he had scheduled a visit in 1762, but that was cancelled due to torrential rains. Another poem refers to a planned visit in 1764 that was also thwarted by weather. So instead he painted the Ten Landscapes based on distant views of Mount Tiantai glimpsed during his two visits to neighboring Mount Yandang and from his own imagination. His deep knowledge of the history and legends of the sites combined with his literary ability and his skill as a painter to capture the essence of the landscapes so effectively that even the Emperor, who had toured the area an unprecedented six times, never realized it wasn’t painted from life. Qian Weicheng’s early death did have one positive side-effect. It ensured that his most of works were not scattered and remained in the imperial collection. 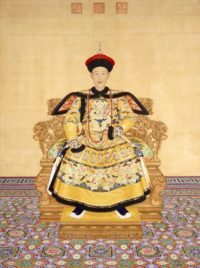 There are 243 of his paintings and calligraphies in the Palace Museum today, and only 43 (mostly paintings) found in other collections in China. Very few pieces have turned up on the art market in auctions, and the ones that were, were smuggled out of the imperial collection by the last emperor Pu Yi. the Tang (618–907), Song, Yuan, Ming, and Qing (1636–1912) dynasties. They temporarily stashed the purloined cultural patrimony of imperial China in Pu Yi’s father house Beijing, then packed it all up in 80 crates, scored a pass exempting the boxes from being tolled or examined and transported them to the Tianjin British Concession where Pu Yi had an estate. On November 5th, 1924, warlord Feng Yuxiang expelled Pu Yi from the Forbidden Palace. He fled to Tianjin, although not to his property in the British quarter, but rather to the Japanese Concession. 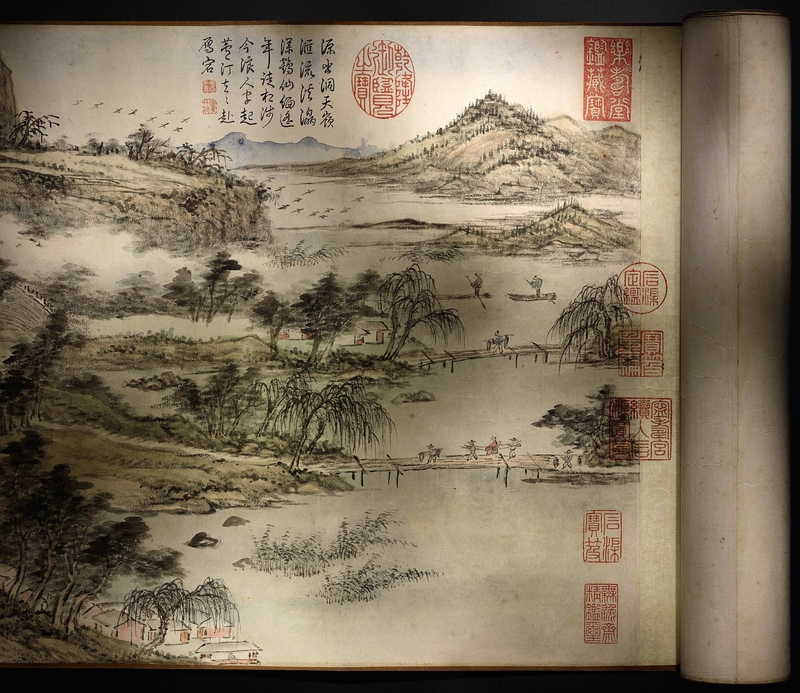 A few months later, the Qing Dynasty Aftermath Committee discovered a list of all the books and artworks Pu Yi had “gifted” to Pu Jie, the Ten Landscapes among them. It’s not clear if some of the works were reclaimed by the warlords that ruled Beijing for the next few years, or by the Kuomintang when they defeated the warlords in 1928, or not at all. We just know that numerous pieces on the list were, at some point, sold. After the Communist Party’s victory in the Civil War in 1949, the scroll was reclaimed by the government office that preceded the State Administration of Cultural Heritage, one of thousands of paintings and other objets d’art confiscated from dealers and people deemed enemies of the state like Jin Bosheng (who had been an official in the Japanese puppet regime of Wang Jingwei during World War II) and Yang Pu-Jie (a onetime favorite of Mao’s who had joined the Nationalists in the 1930s). Experts were enlisted to authenticate the large trove of artworks, and while some important pieces by Qian Weicheng were authenticated and squirreled away in the Palace Museum in the Forbidden City, for some unknown reason Ten Auspicious Landscapes of Taishan was not. It disappeared into the private market and was apparently sold repeatedly. Now it has reemerged into the light of a Sotheby’s auction with an eye-watering but entirely reasonable pre-sale estimate of $6,400,000-8,960,000. The auction will be held on April 3, 2018, at Sotheby’s Hong Kong office. Here’s hoping it doesn’t disappear into another private collection not to be seen again for another 100 years.